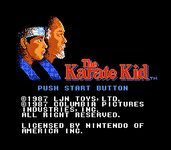 The Karate Kid video game is loosely based off the events of the first two Karate Kid films. The player starts off in the karate tournament held at the end of the first film and must win several matches is a row. The rest of the stages take place in Japan with the player controlling Daniel is side-scrolling action having to kick and punch his way through the baddies. Daniel has a life meter that is drained every time he is touched by an enemy. Mini games are available from time to time in the form of catching flies with chopsticks, breaking ice blocks, and avoiding the swinging hammer. Success in these games award the player special crane kicks and driver punches that do additional damage to enemies.